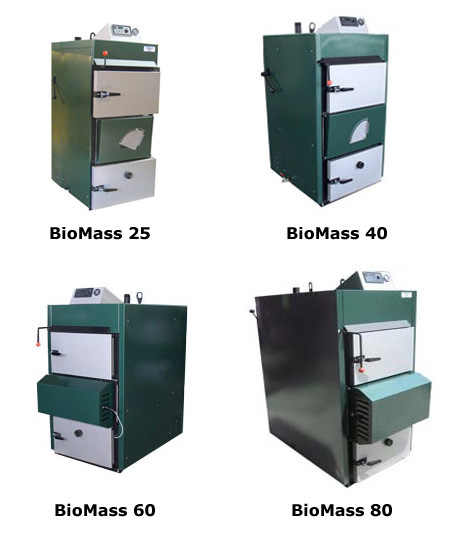 BioMass Gasification Boiler is an ecological and efficient source of heat for closed pressurized or open radiant systems, BioMass uses dry fuels like seasoned wood chips or pellets, and extracts maximum heat for your system by using gasification process and secondary combustion , which results in complete, practically emission free burning. 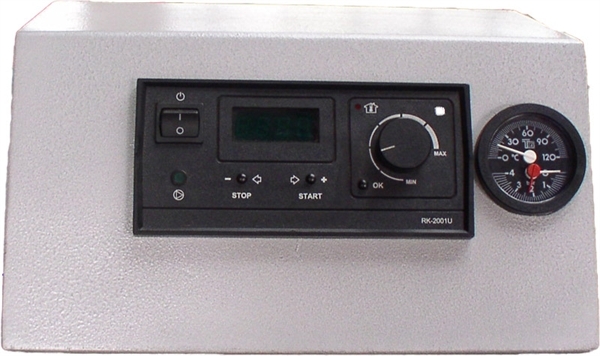 BioMass boiler come with a new digital programmable controller, RK2001UA, which allows or customization of the operation. 1. Drying and heating wood until the release of gases (hydrogen and carbon monoxide). 2. Burning of gas mixture in lower chamber at 2200°F. 3. Transfer of the flue gasses to heat exchanger on the back of the boiler. 4. Ejecting the gasses though the chimney pipe. 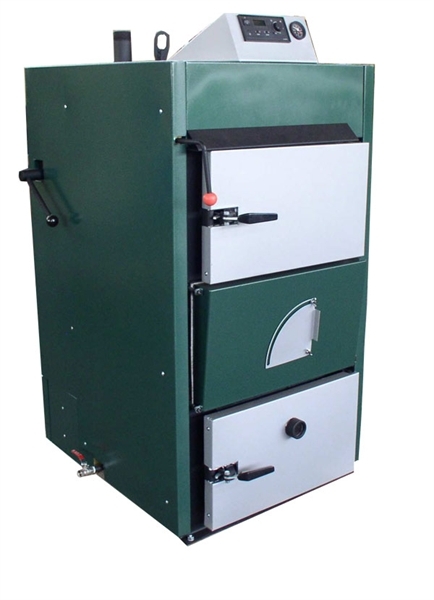 The best indicator of successful wood gasification is the lack of smoke exiting the chimney. Wood is a renewable resource like solar, water or wind power. They are all energy sources, which never become depleted, unless improperly managed. Wood storing reduces its moisture and simultaneously increases its heating value (energy volume, which may be used up during burning process). 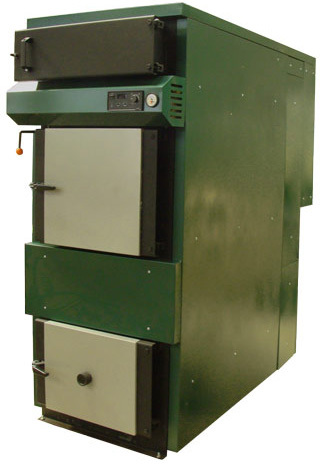 Modern boilers utilizing wood in gasification processes use energy contained in wood with efficiency that is three times higher than traditional boilers. 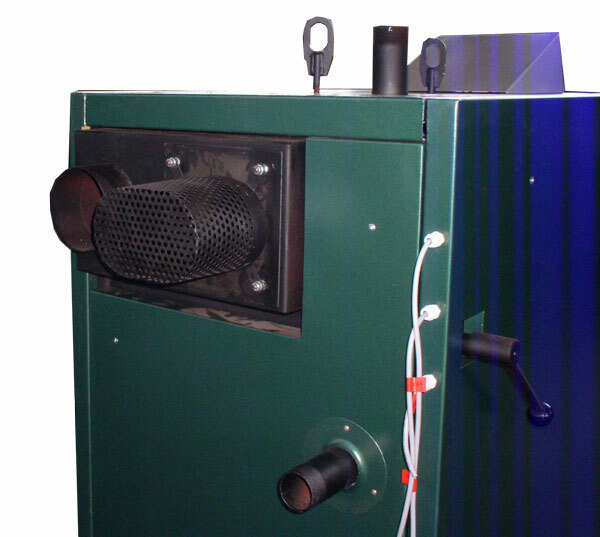 Smoke and other emissions are cut to a very low level, making our boilers very nature friendly. BioMass Gasification Boilers are adapted for burning of any kind of wood ranging from sawdust to chunks of wood. The best way to achieve recommended wood moisture is to cut timber during the springtime, and let it season in a shed or under a cover. 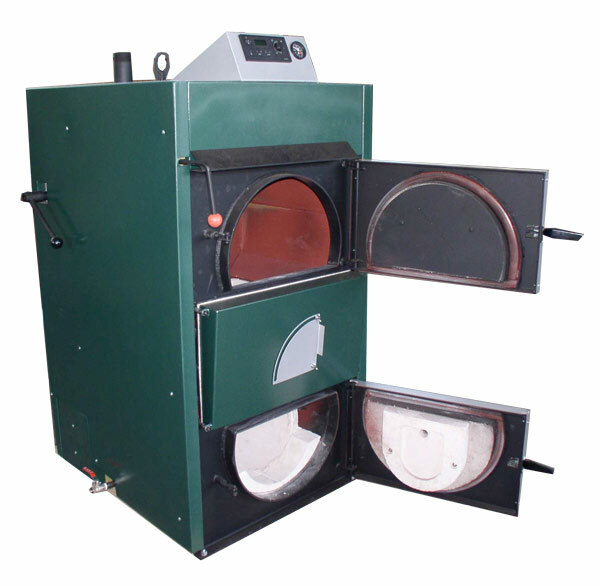 The recommended source of fuel for the BioMass boiler is cut and split firewood that has a moisture content between 20% and 35%. 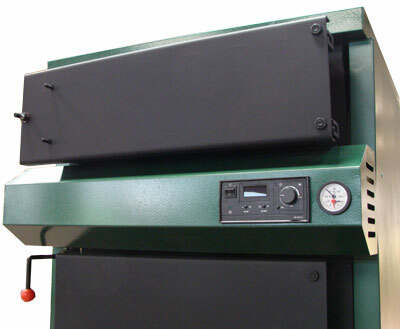 Log size should be around 6 inches in diameter and about 20 inches in length for the BioMass 40 and up to 30 inches in length for the BioMass 60. Smaller size wood can be used as well, including briquettes, artificial logs, wood pellets, and corn cobs with kernels. Additional fuel sources like dry wood chips and saw dust can be added along with dry logs. 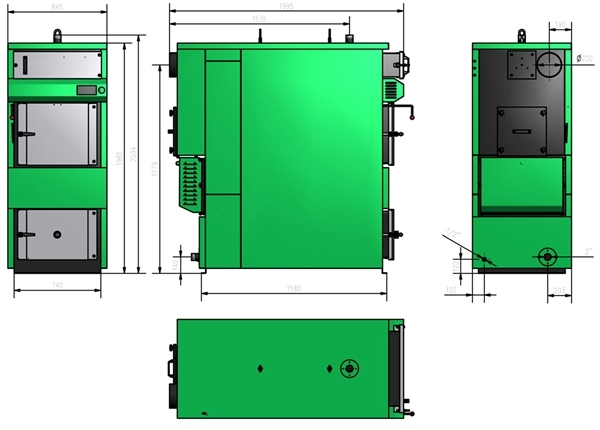 The BioMass boiler’s WATER JACKET is made out of 1/4” boiler plate steel. 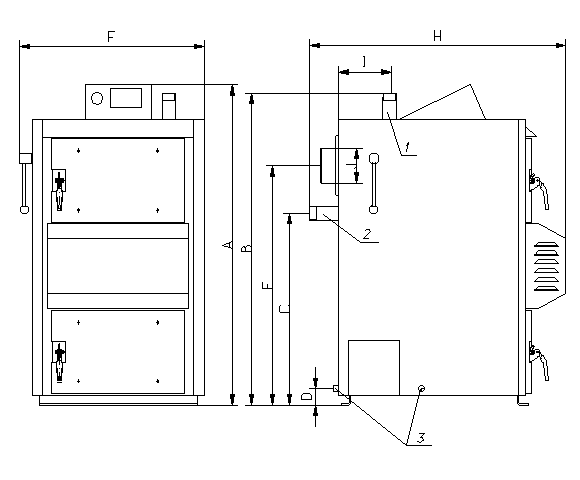 The HEAT EXCHANGER is made out of multiple 3-inch diameter fire-tube boiler tubes (0.150 inch in thickness). 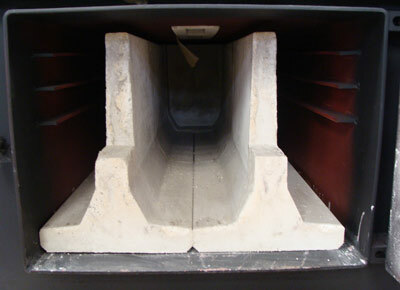 Exhaust gases are released into a 6-inch diameter chimney outlet. 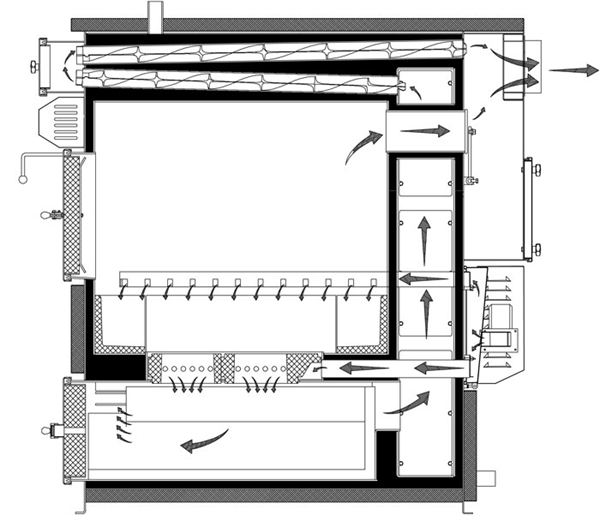 Special construction of the BioMass boiler allows for a very efficient heat exchange from the boiler into the heating system. The OUTER INSULATION JACKET, made out of mineral wool, minimizes heat loss from the boiler, allowing for the maximum amount of heat transfer from the boiler into the heating system. During the gasification process, wood inside the loading/burning chamber is dried and gasified. 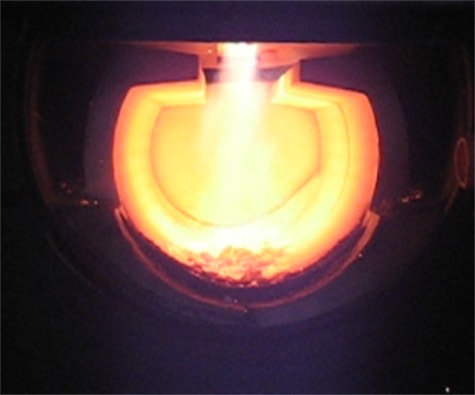 The gas (smoke) produced is drawn down through the ceramic nozzle into the ceramic-lined gasification chamber with a blower and burned at very high temperatures. 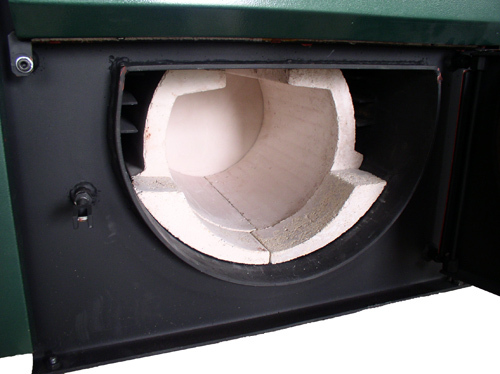 The hot, burned gas travels up through the heat exchanger tubes, out the exhaust opening and into the chimney. The heat of gasification (around 2200°F) completely burns off virtually all smoke and particles. Gasses released from the chimney are practically invisible and do not contain unburned particles.